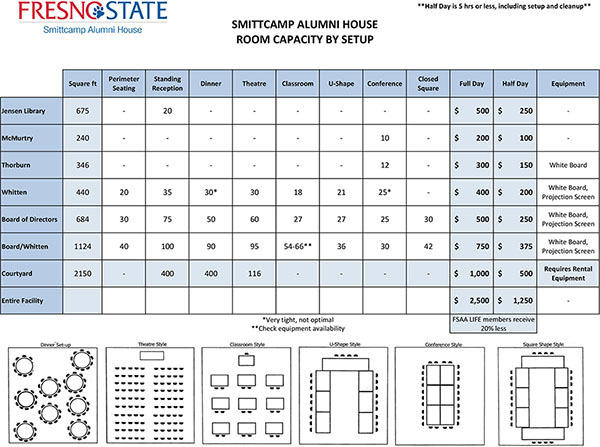 • Recognized Student Organizations are allowed one use of the Smittcamp Alumni House per semester with no rental fee. Set-up/clean-up and staffing charges still apply. 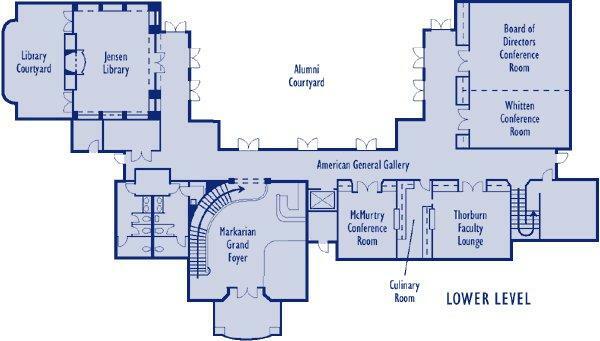 • Additional events will be charged the full rental fee of the room/facility. • Rooms are equipped with projection screens and/or small white boards. Organizations are responsible to supply their own A/V equipment. • Organizations may not reserve on behalf of other organizations. • Full balance of charges (set-up/clean-up and staffing charges) are due one-week in advance. Credit cards and checks payable to “Fresno State” will be accepted. • To be valid, confirmations must be signed by the faculty/staff advisor and must be received 4 weeks in advance. • Reservations are accepted no more than one year in advance and must be at least 30 days before the event. • All catering and food service must be arranged through University Catering. • Courtyard events require equipment rental from an off-campus vendor. Organizations are responsible to make these arrangements and to coordinate set-up/break-down. * How will this event be funded? * Will you be using a tent for your event? Food Waiver may be requested at least 30 days prior to the event. Please contact Food Service for details. A copy of the waiver request and documentation of approval must be on file with the Alumni House 5 days prior to the event. There will be a minimum charge of $25 for all events with approved food waivers to cover additional clean up and trash removal services normally provided by University Catering. * All student organized events must meet with the Event Review Committee to discuss your event. Contact Student Involvement Desk: 559-278-7967 / Office: 559-278-6024 Documentation of approval must be on file with the Alumni House 5 days prior to the event.